As a small group, we could stay at smaller boutique hotels and riads (converted palaces with central gardens, acting similar to bed and breakfast inns). We did not stay at five star hotels, of which there are many in Morocco, but were content with the simplicity (and cost) of three and four star accommodations. Driven by the Morocco RPCVs search for their favorite foods of Morocco’s famous cuisine, we commissioned feasts and comfort foods and reveled in the street foods and snacks available and in season. We visited four UNESCO World Heritage sites (the ancient Roman city of Volubilis, the Fes El Bali Medina, the Kasbah of Ait Ben Haddou and the Jemaa el Fna square of Marrakesh). We walked the medinas of several cities, bought rugs, textiles, spices, pottery, and argan oil cosmetics, hiked the palmeries and watched the world go by in sidewalk cafes sipping mint-infused tea. What differentiated this trip experience from that of the circa 10 million other tourists visiting Morocco annually was the Peace Corps connection. On arrival in Rabat, we were briefed on Morocco’s economic foundation, path to sustainable development, and governance by Dr. Youssef Ben Meir, President of the NPCA Affiliate Group, the High Atlas Foundation and Marrakech, Morocco RPCV 93-95. The following morning, we visited the Peace Corps office in Rabat hosted by Morocco RPCV Doug Teschner (Sale, Morocco 71-73) now serving as a Senior Advisor to Peace Corps Morocco during a staff transition. The next day we toured the American Legation in Tangier, the US Embassy equivalent in Morocco for 140 years, the only National Historic Trust property outside of the US and home of the Tangier American Legation Institute for Moroccan Studies (TALIM) and were hosted by the Director, John Davison (Berkane, Morocco 83-85). In Tangier, we also met with the Director of the American Language Center in Tangier. Continuing the Peace Corps connection program, in Meknes at lunch we had discussions with a Moroccan political expert and later by the Director of the Meknes American Language Center. We were joined at dinner by two Moroccan millennials with experience working with Peace Corps trainees and volunteers who were fluent in English. We also met with an ambitious American student of Arabic on a Department of State fellowship. In Marrakech at dinner at the “Peace Corps” Hotel Toulousain, we were joined by the librarian of the American School of Marrakech (and Morocco RPCV 95-97) and her husband, the Director of the Amal Women’s Center. On our second day in Marrakech we visited the office of the Moroccan NGO, Project Soar, which supports girls’ education and is staffed by Morocco PCVs and RPCVs. On our second night in Marrakech in addition to Project Soar staff, we were joined at dinner by a Morocco RPCV 82-86 doing short-term volunteer work with the High Atlas Foundation and a Morocco RPCV 82-84 now retired and living in Marrakech. The trip was supported by Kristy of Morocco, a one-women travel agency, who arranged and guided our tour. Kristy was a PCV in Essaouira 82-84 and never left Morocco. 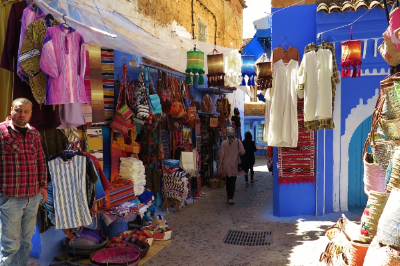 She worked first in the Moroccan craft industry designing bags and belts and later led adventure camel and biking tours for more than 20 years. She has led more than 200 trips in Morocco and was familiar with our lodging and restaurant choices. Tim Resch, President of Friends of Morocco and RPCV 1970-1974 Ouezzane and Rabat, Morocco, developed the program for Peace Corps connections. Join NST's encore trip to Morocco, October 8-21, 2017. Visit Next Step Travel Morocco for details.